Journey to South Africa, where 11 year old heroine Nolitye “Keeper of the Stone” navigates life in a township of "squeezed-in shacks, dusty streets, shebeens and other small corner stores, and stray dogs." Nolitye, her friends Four Eyes and Bheki, and school bully Rotten Nellie experience everyday childhood, then embark on an urgent, fantastic quest to overcome evil forces and find Nolitye's missing, spell-cursed father, Xoli. The novel mixes elements of real life (school bullying, friendship, absent parents, disappearing children, cultural traditions) with magical realism (talking dogs and wildlife, evil witches, journey to a fantasy world, magical powers). Potent themes here: family; community; youth empowerment and heroics; ancient cultural wisdom; good vs. evil; persistence. Magical elements resonate and blend with scenery, cultures, and rich mythology of Southern Africa. Fans of J.K. Rowling's Harry Potter series, or Tomi Adeyemi's Children of Blood and Bone will likely savor this adventure, which delivers a hopeful ending. A solid choice for middle-grade discussion; works as a read-aloud for ages 9 and up. Prizewinning author K. Sello Duiker (who came of age during apartheid in Soweto, but died in 2005, age 30) is a masterful storyteller. 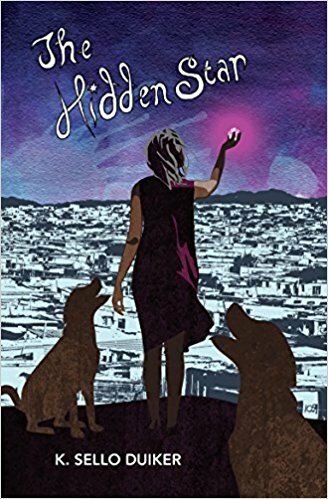 THE HIDDEN STAR was first published after Duiker’s death in 2006 and is now available internationally. This essential, uplifting fairy tale offers windows into a complex and beautiful world that has been much under-represented in contemporary children’s literature.